The Competitions committee had a very busy evening sorting out the cards last week, with lots of prizes up for grabs! With continuous high scores for the Lamb Competition, last week’s Winners were Catriona Bolger with 19pts and Alice Duffy with 15pts. Huge congratulations go to Eithne Mc Aviney on winning the Aranmore Alliance Competition in Concrawood on Monday last. Silver: Michele Costello and Bronze: Chris Monahan. Both ladies will go forward to represent the club in Kells, Co Meath on May 15th. Commiserations to Jeanette Keenan’s team who fought a good battle against Dundalk golf Club in the AIG Challenge Cup. Good Luck to the Minor Cup Team in Kells on Saturday. The winner of the weekly Seniors competition was Eithne Mc Aviney with 15pts. A reminder that the seniors meet every Tuesday morning at 11am, and all welcome. Beginner ladies evening takes place in Concrawood Golf Club, Tuesday 23rd April at 6.30 p.m. with Head professional Conor Mc Kenna, Contact the office 0429749485 Ext 0 for more information. Finally Happy Easter to all members and fellow golfers. Cathryna Craig hit high scores this week in the Lamb Competition, which puts her team back in contention for the Spring League. Mona Metcalfe & Catriona Bolger’s teams are also up there, so this week, being the last week will see a Grand finale to the league and who will come out on top! The ladies 3-person team event was played on Sunday last and the winning team was Lady Captain Criona O Reilly, Pauline Campbell & Mary Carthy from Dundalk Golf Club, runners up was Cathryna Craig, Eithne Mc Aviney and Jeanette Keenan from Concrawood Ladies Golf Club. 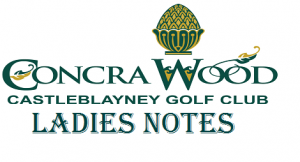 Beginner ladies evening takes place in Concrawood Golf Club on Tuesday 23rd April at 6.30 p.m. Head professional Conor Mc Kenna will be hosting this information evening. Please contact the office 0429749485 Ext 0 for more information. Don’t forget – Senior Ladies meet every Tuesday Morning at 11.30a.m. Chris Monahan is back on Top. Not only did Chris Monahan take the top spot for the League competition this week and putting her team 7 points ahead of all the rest – she was out right Winner in the Gardening Club repeater. Well done Chris. Winners of this week’s lambs are Chris Monahan 17pts, Andrea Mulligan 15pts and 3rd prize bottle of wine Moira O Brien 14pts b/d. Fairways and bunkers back in play placing through the green. New repeater started – Ladies Open day 3 person team on Sunday 7th April spaces still available. After the rain of last week with our competition and league being cancelled the ladies are back on the fairways and returning great scores which should see our league teams taking a big jump this week. Faela Heavin scored 20 points and Mona Metcalfe 19 points giving them a clear run from the field in this weeks competition and also boosting their teams position in the spring league. As we are half way through the Spring League Catriona Bolger’s team leads the way by a point so its all to play for ladies. With wind and rain taking over at Concrawood on Saturday morning our two Captains braved the elements and drove off straight down the fairways and got our golfing season officially started. There was a huge turnout for both Captains and is was a very special one for current Lady Captain Andrea Mulligan as she celebrated with family and friends. Andrea’s mum (Nora Mulligan) who joined her on the day was the First Lady Captain at Castleblayney Ladies Golf in 1982 and Maura Moore who was Nora’s Secretary was also there, what great stories where told. We would like to wish our Lady Captain Andrea Mulligan, Captain Patsy Boyle, Junior Captain Keith Morgan and President Eileen Kerr best wishes for a great golfing year. Lady Captain Andrea Mulligan held her first committee meeting of the year. She welcomed her committee members old and new. After a Minute silence for all deceased members she continued with the meeting. She outlined some events for the year ahead and allocated jobs to her committee. Congratulating Eileen Kerr on being the first Lady President at ConcraWood Golf Club, sending best wishes to Captain Patsy Boyle, she also sent Congratulations to Annette Mc Mahon on the Birth of her new baby girl Nessa. Andrea said she was looking forward to the year ahead and our first Club competition of the year starts this week, so ladies Spring is in the air and the weather is lovely and there are no excuses not to get out and loosen that swing!! Autumn League comes to an end with Cathryna Craig’s team winners with a fantastic score of 160pts they were leaders right from the off and played steady golf throughout the six weeks duration of league well done to Cathryna and the rest of the team Andrea Mulligan, Briege O Reilly, Tracy Liddy O Connor and Shirley Mc Mahon, 2nd placed team of Eithne Mc Aviney, Jeanette Keenan, Marina Ni Threasaigh, Catherine Dignam and Marita Kiernan were slow starters and didn’t get in to the swing of things until the third week when they started to return some decent scores and with 154 pts earned for themselves a place in prizes, Cat 1 winner was Catriona Bolger Cat 2 Eileen Kerr and Cat 3 Margaret Flack ,thank you extended to Shoe City for sponsoring the League. Lady Captain Christmas Dinner. A very enjoyable evening was had by all last Friday at Lady Captain Carmel dinner. Lovely food served by the staff of the view restaurant and good craic and banter was the order of the night, during the evening outstanding prizes were presented and these included, Golfer Of Year to Michelle Costello, Birdie tree to Catriona Bolger and the Gardening Club Repeater prize which was also won by Catriona Bolger congratulation and well done to all the ladies who collected prises on the night and indeed during the past year. Dates to put in your diary of upcoming events Lady Captains Christmas dinner Friday 23rd November, Golf club and Concrawood A.G.M. Friday 30th November. Results for the last two weeks nine hole competitions . 2nd Josephine Mc Cahey 15pts. Autumn League started last Friday, rules and regulations posted in the locker room. Finally I take this opportunity to extend the sympathies of the ladies club to Cait Quinn on the death of her sister Gertrude and to Dorren Quinn on the death of her brother Fintan, may they rest in peace. Josephine Mc Cahey Wins last eighteen hole competition of the year. After winning Lady captains prize Josephine’s game appeared to dip (her words not mine!!). However over the last two weeks she got it together again as runner up in Dorreen Harte competition, and Winner with 38pts in Corrigan Kitchens competition last Thursday well done to her. Winner in Dorreen Harte’s competition was Chris Monaghan another lady who has featured in the winners enclosure quite a lot this year. Well done to all winners over the summer and hopefully the good golf will continue for the Autumn League, which commences on the 19th Oct. get your name down early so as not to be left out of draw. Our repeater for conquer cancer raised €500, which was great money for such a worthy cause and thanks to all who supported repeater. This week ConcraWood is buzzing with the Challenge Tour taking place, well done to all for the hard work that has gone in to organizing this huge event and bringing it to our club also everyone who is volunteering there time over the next few days to help in the smooth running of the competition. Last weeks competition was Coogan Couriers, and this was stroke and winner was Catriona Bolger with a great round of 72 nett .Catriona was also in the winning enclosure at the recent Golf Digest competition in Concra when she won longest drive ,congratulations to Marie Sweeney who came second in ladies section with 36pts and to Jeanette keenan winner with 37pts. Past Captains and club outing to Farnham Estate golf resort Sunday 16th Sept details in Ladies locker room. After the disappointment of last Saturday when our Lady Captain Carmel had to make the tough decision to cancel her competition due to the inclement weather conditions, Sunday’s golf got underway in glorious sunshine. Josephine Mc Cahey was the lady who held it together and returned a great score of 37pts to claim first prize ,her first lady captain win in Concra, Runner up was Michelle Costello, best gross went to Dorren Quinn, while Eileen Kerr took 3rd place .Cat. 1 went to Janette Coogan, Cat. 2 Catryna Craig, and Cat.3 winner was Sheila Moore. Congratulations to all the prize winners, a fabulous array of prizes were on display, A big thank you to Carmel for her attention to detail hospitability and generosity to all the ladies . Results from the captains prize to ladies. Winner Catryna Craig, Cat. 1 Michelle Costello, Cat 2 Chris Monaghan,and Cat 3 Martina Conlon. Last week was a great one for our ladies with our Hilton shield teams winning two out of their three return matches against Cavan golf club .Junior team keeping the shield in Concra for another year and Senior team bringing the shield back after an absence of three years,hard luck to intermediate team who weren’t so lucky on the day. This weekend is the big one for Lady Captain Carmel ,on Saturday she hold her day and everybody in the club is eagerly looking forward to it .we wish her all the best and please God the sun will shine for her and she will have a very successful day. I also wish send the condolences ‘of the club to Eileen Kerr on the sad passing of her sister Mary R.I.P. all these recording breaking scores keeping the handicap people very busy and making the betting for Lady Captains very interesting. Our Lady Captain who has been featuring in the winners enclosure these last few competitions returned a outstanding score of 43 pts to claim the Rose bowl on Sunday afternoon, congratulations Carmel and well done. Last years winner Michele Costello came in with a very respectable score of 38pts to take runner up prize, Cat.1 went to Rosie Hughes Merry 34pts,Cat 2 Sile Moore 35 pts and Cat 3 went to Cait Quinn 32 pts ,great to see Cait back in the winners enclosure, 9hole competition was won by Eileen Kerr well done to all the winners and thanks to Yvonne and Seamus Duffy of Duffy Oils for their continued sponsorship of Rosebowl. Donagh Nugent and Chris Monahan are two ladies who are reducing their handicap’s in style this year ,in the recent Garda Prize Donagh returned 68 nett to win and Chriss 69 nett to come second 3rd on the day was Michele Costello with 76 nett fantastic scores and well done to them. Last weeks Hi Maintenance comp winner was Janette Coogan with 35pts congratulations to all our recent winners and thanks to Hi Maintenance and the Garda for their continued sponsorship. Hilton Shield Concrawood were hosts to qualifying round of this years Hilton Shield competition, teams from seven clubs in Cavan and Monaghan took part in competition. Leading qualifiers in all three sections were Concrawood with County Cavan golf club second ,well done to all the teams that took part on the day and good luck to those involved in the match play. This weeks competition is N.B.C.R.I. I would encourage you all to support this worthy cause, also your support in the nine hole repeater would be much appreciated. Ladies summer scramble takes places every Friday evening ,rolling draw from 6.15pm.if your looking for some social golf this is the place to be . Results ..winner of Shorts butchers comp.,Chris Monahan 34pts,second and third place went to Mona Metcalfe,and Catriona Bolger with 33pts Last week Winner was Tania Macklin 29pts and nine hole competition winner Janette Coogan well done girls, winner of repeater for gardening club is Donagh Nugent ,repeater for May and June will go towards funding our teams. Best wishes to Andrea Mulligan and her Challenge Cup team who are representing our club this Sunday, and hard luck to Rosie’s Junior Foursomes team who bowed out of the competition in Greenore against a strong Balbriggan side . What a fantastic turn out of members for opur very popular Captains Carmel and Brian. Our Captains Carmel, Brian, Junior Captain Padraig,and President Paul tee up and had fantastic drives.We all continued our 18 hole competition and the winners on the day were 2nd place Cathal Simpson,Ronan Mc Donnell and Yvonne Duffy,1st place Mac Sammon,Tate Donnelly,Pat Conlan,and Mona Metcalf. Both Captains congratulated every one on the great turnout,thanked all for their good wishes and gifts they received on the day ,they spoke of the vibrant club we have and the bright future going forward.There was also a special mention of the Junior Captions Hole in One on the 6th Hole . Heineken were thanked for there sponsorship of the drive in. The Captains also made a donation to the LauraLynn foundation. Details of the above competition are available in the Ladies locker room or on Ladies golf whats app,if interested in playing organised a team and arrange time /date with your opponents. The entire membership of Concra Wood are praying hard to their favourite saints in the hope that the ” Beast from the east” will not visit our course this weekend, instead that the sun will shine and our popular Captains Carmel and Brian will make it to the first tee and send those balls down the fairway ,and get their year going. With course manicured to perfection, the champagne on ice and the flags flying Saturday promises to be a great day, make sure your name is on time sheet and your included in draw for what is a very special day in the golfing year, we wish them all the best for their year ahead. Spring League, now in its third week, some super scores being returned, in spite of this there is little between the teams still all to play for!! The first ladies open of the year is on Sunday 8th April format is three person team event, time sheet now open. Concra Wood Castleblayney Ladies Golf Club. The entire membership of Castleblayney Golf Club was shocked and saddened on hearing the news of the sad passing of our much loved and long standing member Mrs Rose Mc Bride R.I.P. Rose was a tireless supporter of the Ladies club, from serving on committee, supporting the weekly competitions, to representing the club in interclub matches. It was in match play and team events that Rose excelled and played her part over the years in bringing silverware back to Castleblayney. A keen golfer Rose featured on numerous occasions in the winners enclosure. One of her many notable wins was in 2009 in Concra Wood when she claimed Lady Captains prize. The high esteem in which Rose was held was so evident by the large turnout of her fellow golfers for Guard of honour at her funeral. We extend the sympathies of the Ladies club to her husband Tom, daughters Aisling and Siobhan, sons Dermot and Thomas. We also extend our sincere condolences on behalf of the ladies club to our Head professional Conor Mc Kenna on the sudden passing of his Father Michael on Friday evening last. The weather seems to be the winner in Golf these last weeks, but things are improving slightly as we head towards the end of February and our Ladies are now returning to fairways. Spring League due to start Friday 16th February weather permitting – so ladies get your name on draw sheet in Ladies locker room, make sure you don’t get left out. Performing her first official duty Lady Captain Carmel officiated at the presentation of all outstanding prizes last Thursday. Congratulating all the winners, she paid a particular tribute to Janette Coogan, recent winner of the prestigious and coveted Golfer of the Year trophy. A most enjoyable evening was had by all in attendance. A huge crowd attended when Santa Claus visited Concra on Saturday, this is one of the highlights of the year in the calendar of events at Concra. Deepest sympathy is extended to Janette Coogan on the recent death of her son-in-law Keith Corrigan. Lady Captain Carmel wished all the ladies the joys and blessings of Christmas and lots of good golf in 2018. All present joined in extending congratulations and good wishes to incoming officers, Captain Brian McGovern and President Paul Shortt. Turkey winners in November are – Carmel McAleavey X 2, Sile Moore, Breige O’Reilly, Donagh Nugent, Marina Ni Threasaigh, Mona Metcalfe, Martina Conlan and Michele Costello. As 2017 draws to a close and Lady Captain Faela hangs up the blazer, we thank her for her leadership and guidance during her reign in 2017. A wonderful Lady Captain. Ladies AGM Thursday 7th December at 8pm. Lady Captain’s dinner Saturday 2nd December.